At the risk of becoming tedious, we’re looking at another wonderful Murphy Anderson inked cover. My admiration for Murphy’s skills remains undiminished to this day. In an earlier blog post, I wrote about getting to know Flash editor Julie Schwartz a little at a party at my house following a comic con in Cleveland. What I didn’t mention was that Murphy was at the same party. He was a true southern gentleman, and, I might add, the only one wearing a suit and tie. You really couldn’t meet a nicer guy. At one point during the evening at my house, I found myself chatting with Murphy in my studio. He told me about his studio being in the basement of his home at one point, and how he had to put a little gate to keep his young children from crawling in while he was working. It was so nice to have a visual image of what it was like when this art work that I admire was being created. 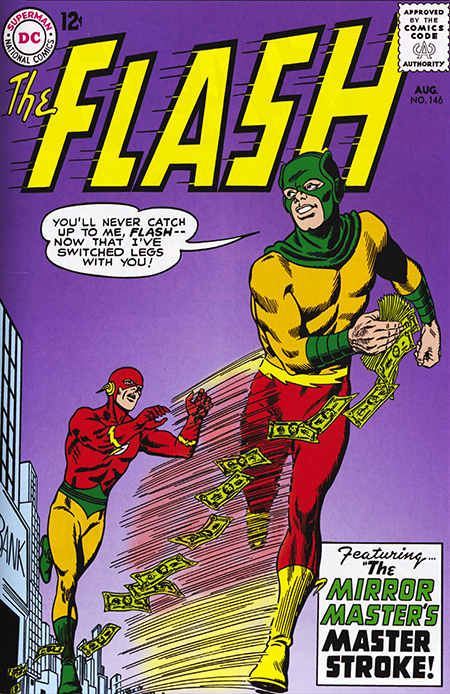 The Flash’s tangle with the Mirror Master in this issue is especially notable for one nice twist. At the start of the story we see Barry attending a meeting of Professor Dobill’s Course on Greatness which Iris had pushed him to take way back in issue #136 which said story coinkadinkally featured the Mirror Master as well. And then we find out that, since he escaped from jail, MM has been attending the course too so he might pick up some tips on how to defeat his nemesis the Flash. Of course, it doesn’t work, but it’s a very nice touch by the author John Broome. Broome also does another nice SF turn when in the second story he has the Flash use his cosmic treadmill to travel to the future point when the Earth’s sun goes nova. He does it to get photos for a piece his girlfriend Iris is writing about novas. Now that’s going the extra mile, wouldn’t you say?